Earlier this month, my story, “The Backyard Transplant,” made its debut in the summer issue of Goreyesque, an Edward Gorey-inspired literary journal. Featuring the exploits of a little girl named Francesca, a makeshift surgeon who’s armed with safety scissors and a mallet, this is one of my lighter tales, a combination of the humorous and the macabre, not so unlike the oeuvre of Edward Gorey himself. Ever since I first discovered Goreyesque last year, it became one of my major writing goals to place a story with the journal. After all, I’ve been a devotee of Edward Gorey from the time I was in kindergarten, his morbid illustrations always a delight to my book-loving self. As an adult, my Ogdred Weary obsession only grew and eventually took me all the way to New England where I toured his famous Elephant House in Yarmouth Port, Massachusetts. Seriously, that’s how Gorey crazy I am. All this fandom started thanks to my father, which is quite appropriate since I wrote “The Backyard Transplant” for him. Last winter, he himself was a transplant recipient. While the rest of my family sat in a Cleveland Clinic waiting room, I decided to try my best not to think about my father being cut open on a table for the twelve-hour procedure, so I instead opted to invent a gruesome yarn that I could read to him once he woke up. Consequently, as a highly trained lifesaving surgeon scooped out my father’s old lungs and put in two new ones, I penned “The Backyard Transplant.” Perhaps my task was not quite so monumental, but hey, we do what we can. Ultimately, “The Backyard Transplant” became the first story I read to my dear ol’ dad after he woke up in the hospital room. My most vivid memory of that afternoon three-days post surgery was seeing him laugh for the first time. Indeed, I saw, not heard him laugh because he still had the obligatory post-transplant feeding tube, so he couldn’t actually speak or make any sound at all. But that didn’t stop him from laughing, knee slapping and all. So for the remainder of my writing career, “The Backyard Transplant” will hold a special place in my heart. And having it appear in an Edward Gorey-inspired journal? Well, that’s just icing on a very morbid cake. 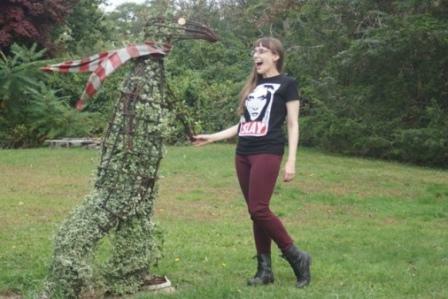 This entry was posted in Fiction and tagged Edward Gorey on July 31, 2015 by gwendolynkiste. For this week’s author spotlight, I’m pleased to present jack-of-all-trades author Bill Soldan. Like several of my previous interviewees, I met Bill through Sanitarium Magazine where we both toil away as slush pile readers. During the course of our interview, Bill shared his thoughts on everything from balancing work and family to what it’s like to hang out at Emily Dickinson’s house. Good stuff all around for both aspiring and working writers! Well, I’d like to say I sprang from the womb with writerly ambitions, but I first fell in love with the idea around age 12. I stress the word “idea” because, although I was a ravenous reader my whole life, I never really tried to write anything of my own. When I was about 12, I was reading Stephen King’s The Shining and discovered my mom’s electric typewriter at about the same time. The result was about a paragraph of something called “The Deadman’s Shortcut” or something equally ridiculous. I had no idea what I was doing, but King’s novel was the first book to make me cling to the idea of writing stories. But I was more into visual art as a teenager and didn’t really write fiction after that sad first attempt. There was a period, however, during which I thought I was Jim Morrison reincarnated. I had the role down, too: the attitude, the hair, the reckless abandon, the concho belt—pretty much everything but the leather pants and the talent. But then, I was only like 14 and a total idiot. Nevertheless, that was the beginning of writing poetry and songs for me. I did that for many years, still not knowing what the hell I was doing, and eventually I took a fiction class, because deep down that was still something I had an inkling to do. For the last, say, four years, fiction has been my primary focus. I’m still figuring things out, though. As for favorite writers, I can never answer this question without listing the following authors: Donald Ray Pollock, Richard Lange, Daniel Woodrell, Benjamin Percy, Bonnie Jo Campbell, Flannery O’Connor, Jim Carroll, Sherman Alexie, Stephen King, Clive Barker, and many other seemingly dissimilar writers. Quite recently, I’ve just discovered the work of people like Craig Clevenger, Brian Evenson, Mitchell S. Jackson, and Denis Johnson (people seem to be shocked and appalled that I haven’t read his work before—and after reading some, so am I). Those are some of the big ones for me right now. You’re currently working on your MFA while simultaneously teaching undergraduates. How has teaching affected your own approach to writing? I can’t say that it has. Not yet anyway. I have recognized that I need to practice what I preach a bit more when it comes to certain things: trusting the revision process, reading my work aloud to find the hiccups in syntax, etc.—but this really applies more to my own academic writing. When writing multiple critical papers at any given time, sometimes it’s all you can do to get them written, never mind toiling over multiple drafts. When it comes to my writing, however, especially my fiction, I don’t have this problem so much. I’ll toil as long as it takes, and then some. You recently returned from the Juniper Summer Writing Institute in Amherst, Massachusetts. What was the most unexpected or surprising thing you learned during the writing intensive? I learned a lot while at Juniper and met some terrific people. The workshop I was in was revision based, so I didn’t generate much new material while I was there, but I came away with the beginnings of a few new things, several more pages of a work-in-progress, and some excellent feedback on some of my stories. I was so inspired by the atmosphere and sense of community that I had trouble readjusting to life for a couple days after I got home. The passion and talent there was nothing short of invigorating. Without outlining specifics, I can say that what I got most from the instructional programming were the tips and insights I received from Brian Evenson and Mitchell S. Jackson. I had the privilege to work with Brian all week, and frankly everything that came out of that man’s mouth was brilliant. He helped me see some areas in my own writing that worked well and some areas that could be better. He also held a craft session that focused on the distinction between people and characters—it was great. Mitchell likewise helped me identify some things in my own writing. I had a manuscript consultation with him, during which he went through two of my stories with me line by line, showing me areas where the narrative was strong and areas where I should capitalize more on my strengths, which he said are “the acoustics of the sentence,” “dialogue,” and “description of setting, especially natural setting.” These comments were very motivating and encouraging, as these are three elements of prose that are particularly important to me. He also held a craft session that focused on “the poetry of prose,” which was an absolute goldmine. What was most surprising, though, was the community of writers. I probably got more from spending time with all these awesome people, from our trips into town, our nightly readings, than from anything else. It was a time I’ll never forget, and I can’t wait to cross paths with some of them in the future. While in Massachusetts, you posted pictures from Emily Dickinson’s house. In my past travels, I’ve always searched for any opportunities to visit the workrooms of famous authors. What kind, if any, inspiration do you find from visiting the home of famous writers, and how does it inform your work? Being there only informed my work insofar as it reinforced something I’ve always believed: that great art can spring from anywhere— if only we pay attention. In what directions would you like to take your writing (e.g. more short stories, novels, nonfiction)? I want to do it all. Poetry, nonfiction, novels, story collections—you name it. Right now I’m focused on getting some more of these short stories out of my head and working on my thesis, a (tentative) collection of linked pieces. I do want to tackle a novel at some point, but I haven’t taken that plunge just yet. I’ve got an idea brewing, but I’m keeping myself busy with several other shorter projects for the time being. I have the urge to write creative nonfiction, but whenever I think of an experience I want to write about, I end up turning it into fiction instead. I’ve come to realize people will believe a lot more of your insane life history when you present it as fiction. Much of my fiction has autobiographical moments, sometimes entire scenes wrenched more or less from memory (a lot more than many people would be willing to swallow if I presented it to them in an essay or memoir) but I’ll leave it to readers to decide which of those are fabricated and which are not. 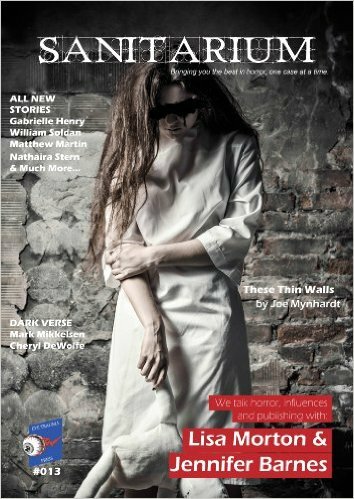 Though it’s far from my best work, I’m still in love with my story “Patchwork,” which appeared in Sanitarium magazine issue 13. It was the first story I ever completed in my first fiction class as an undergraduate, so there’s some significance there. The story has a lot of flaws, the least of which not being that it’s virtually all surface, meaning there’s little to no emotional undercurrent. I have a tendency to write fairly “detached” first-person narrators, but since doing this for a few more years, I’m learning the importance of emotional weight and resonance, even in characters that at first seem cold and indifferent. It’s something I think I’m getting better at, slowly but surely. There are some others out there. Somewhere in the ether. Big thanks to Bill Soldan for being part of our author series this week! Find him on Facebook, Twitter, and Instagram. This entry was posted in Fiction, Interviews and tagged Sanitarium Magazine on July 29, 2015 by gwendolynkiste. This week’s author is a major devotee to none other than Edgar Allan Poe, which practically makes us blood sisters to the cause. 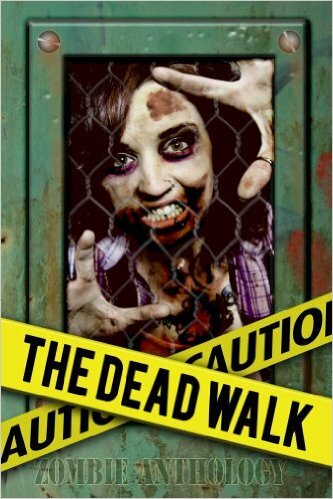 Tawny Kipphorn is an up-and-coming horror writer who pens both fiction and poetry. With a knack for the beautifully macabre, her work has appeared in Sanitarium Magazine and The Tales from the Shadow Realm among other publications. Recently, I talked with her about her many current and upcoming projects. I made the discovery of my passion at fifteen, during english class in my freshman year of high school when we were learning about Edgar Allan Poe. We were reading “Annabel Lee” and something just ignited within me and told me that it was imperative that I do my part to help bring back that literary style, and I’ve since desired to create things with that same sense of beauty. However, I didn’t make the conscious decision to become a writer until my first publication in 2014, which was The Hellequin of Volterrum (Story Version) in the Tales From the Shadow Realm digital magazine. I always had a draw to language and literature since I was in grade school, and even in my teenage years when I was constantly writing and living in my head, I never saw myself becoming an author because I thought my passion would run dry if I were doing it for a living, plus it’s the only area in which I’ve been able to excel. It took me a very long time but I finally accepted that this is what I’m meant to do. Aside from Edgar Allan Poe, I also enjoy Lord Byron, D.H. Lawrence, Patricia Cornwell, and James Patterson. You write both prose and poetry. How is your approach the same (or different) for each? My approach for both is the same in the sense that I really try to do as much research as I can before I begin any project. For poetry, most of the time I try to make them rhyme and go along the same cadence as Poe’s “Annabel Lee”. I describe my poetic style as being Poe meets Seuss. They say you’ll spend the rest of your life trying to recreate the first poem you ever loved, and that holds true for me. I’m a poet at heart and so it comes much more naturally to me than writing fiction, which I find to be much more difficult. When writing poetry, I also like to move words around to give the sentences a more archaic fluidity. Fiction is something I’m working on slowly but surely, it’s a fairly new thing for me. It’s different also because usually with fiction, I have a vision and know where it’s going, but poetry just flows more freely and I won’t know where it goes until the end. What initially drew you to the horror genre, and is it your favorite genre to write? I grew up reading and collecting The Goosebumps Books by R.L. Stine, and also watching a lot of horror movies. I’ve always been interested in the darker more macabre, supernatural things. I spent most of my time in middle school engrossed in vampire themed books and went through a goth stage as well, so I really embraced the whole image. It is definitely my favorite genre though it can be quite challenging to write. When I have a story in my head, it usually plays along the lines of Quentin Tarantino meets Stephen King. When I envision the possibility of bringing these stories to life it gives me a pleasure that I couldn’t get from writing any other genre, especially as a woman in what most would consider a male dominated genre. This is a tough one because it’s a toss up, but I would have to say my favorite published piece is “Rosalee”. I wrote it with the intention of creating something as beautiful as (yep, you guessed it) “Annabel Lee”. Much to my surprise after I wrote it I actually discovered Poe had a sister named “Rosalie” which I thought was amazing. I changed the spelling from “Rosalie” to “Rosalee” as a dedication to my mother. Any projects you’re currently working on? Several! My document folder is horrendous. I have a poem in progress entitled “The Legend of Countess Creep” which is about Elizabeth Bathory. I also have a science fiction short story titled “Project Blue Blood” in progress, and my biggest project in the works is “Steven”, which is the life story of a serial killer with an unusual MO. 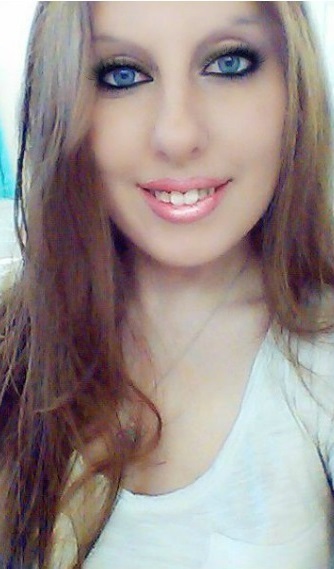 Thanks to Tawny for being part of this week’s author spotlight! Check out more about her writing at her website! This entry was posted in Fiction, Interviews and tagged Sanitarium Magazine on July 22, 2015 by gwendolynkiste. Welcome back to this week’s author spotlight series! Today I’m thrilled to present the immensely talented Miracle Austin! Miracle has been published in numerous fantasy and horror magazines, and she’s currently branching out into young adult fiction. Through the course of our varied interview, it was an absolute joy learning about her creative process and where she plans to go from here as an author. I’ve been writing since junior high and first hearing Drive by The Cars. I wrote mostly little poems, inspired by the music that I listened to. In my teens, I eventually wrote a short story about a 13 year-old boy, Jobie, spending his summer with his best friend, kissing a girl for the first time, and coping with his untimely death. It was called My Last Summer. I’m sure I misplaced it or threw it away years ago. I do still think of Jobie, the character, from time to time. May reinvent him one day…. I wrote off and on throughout my teen, early adult, and mid adult years, but always had pauses in life. I must confess that I’m a late bloomer to the publishing writing world. Honestly, it took a very dark event to occur in my life that propelled me into the writing world, full-speed, where I now consider myself a constant writer. Writing is now my therapeutic playground in many ways. You often write in the horror genre. What initially drew you to horror, and do you have any recommendations for other authors interested in delving into the darker recesses of fiction? I now consider myself a YA/NA Cross-Genre author. I enjoy horror/suspense genres, but not limited to. I must confess that a horror/suspense AM radio station podcast my mom and I used to listen to years ago and two movies, Squirm and Carrie have been my biggest influences to write in the horror/suspense genres. I love your website. It’s a great combination of your published work as well as lists of your favorite stories, authors, films, and music. What are you currently watching/reading/listening to, and how is it affecting your creative process? Wow, thank you for your lovely comments about my website, Gwendolyn. Means a lot. Just finished watching the first season of The Strain on Hulu. I’m so glad that I didn’t let it pass me by because it is one of the best horror/suspense series I’ve watched in awhile. Great story and characters! Cannot wait for season two, which starts next week. If you like vampires and amazing new twists, then you will not be disappointed. I highly recommend. Sure the series rocks. Will be placing on my reading list soon. I’m watching The Secret Life of the American Teenager now on Netflix. Love it and the world of teens. It has five seasons and several episodes, so it will keep me busy for a bit. I watch an episode or two each day, when breaking from writing/organizing my thoughts and all. I listen to all types of music when I write. I’m now currently listening to a mix and the song playing as I complete your interview is “I could never take the place of your man” by cutie-pie, Jordan Knight, originally with New Kids on the Block. I’m currently reading two books by two author good buddettes, The Countess (a series) by Holly Hudspeth and Midnight Outbreak by Brandy Corona. They both rock!! Check these ladies out on Amazon and their websites! “The Meat Lover’s Special” (found in Luna’s Children: Full Moon Mayhem) and “The Study Break” (found in The Dead Walk). I’m currently working on my first stand-alone novel with supernatural and comedic elements called Lonestar UnOrdinary Girl. Big thanks to Miracle Austin for being part of this week’s author series! You can find her on her website as well as on Facebook and Twitter. Also, keep your eye out for her short story collection coming soon from Bathory Gate Press! This entry was posted in Fiction, Interviews on July 15, 2015 by gwendolynkiste. After a two-month summer hiatus, today marks the return of my author interview series! This week’s writer, Quintin Peterson, specializes in crime fiction and thrillers. 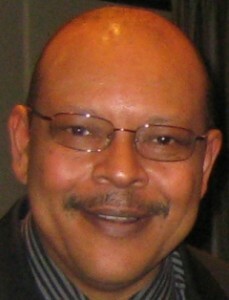 He’s been featured in the Washington Post and Shakespeare Magazine among other prestigious publications. Between projects, Quintin was kind enough to share a little about his own creative process as well as what it’s like to guard some of the most famous works of literature. A few of my favorite authors are James Baldwin, Octavia Butler, Richard Wright, Tananarive Due, Chester Himes, Laura Lippman, George Pelecanos, James Patterson, Nelson DeMille, James Grady, and Lee Child. You’ve led a fascinating life that includes not only your fiction and poetry writing but also a long tenure in law enforcement. How did you balance two vastly different professional paths, and were you ever surprised at how the two could sometimes overlap? It’s quite a juggling act, but working odd hours helps. On the police department I worked shifts like 3:00 pm – 11:00 pm, 11:00 pm – 7:00 am, 6:00 pm – 2:30 am, 8:00 pm – 4:30 am. As a rule, I wrote for two hours before I went to work and for two hours after I got home from work…which I continue to do to this day. (I work 3:00 pm – 11:00 pm, Tuesday – Saturday at the Folger Library.) As a police officer, the kinds of stories I wrote changed. 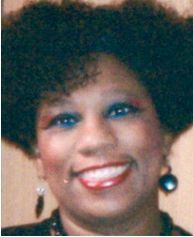 Before joining the police department, I wrote science fiction and horror, and plays similar to Lorraine Hansberry’s A Raisin in the Sun. As a police officer, I began to write crime fiction. I am now known for my “hard-boiled police procedurals”. 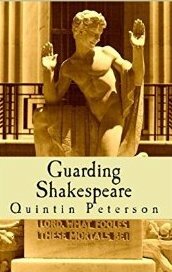 Your novella, Guarding Shakespeare, follows a protagonist who gets harangued into breaking into the Folger Shakespeare Memorial Library where many Shakespeare works are housed. What is your favorite Shakespeare play, and what made you want to write about the library? You’ve been a writer for decades, and your output has most certainly been prodigious. What advice do you have for new writers on how to get their work out there? Aspiring fiction authors should first pick the genre they are most interested in, read a lot of work in that genre, and write a lot. Enter contests in that genre and surf the Net for anthologies in that genre seeking submissions. Anyone who has been in the business for as long as you have has certainly faced rejection, both from editors and readers. How do you cope with the constant struggle of being an artist? I’ve been rejected a number of times, but everything I’ve written that was rejected is now in print. Acceptance is subjective. The trick is to find out when a story has been rejected because it is rotten or just was not an editor’s cup of tea. You may never know which, really. You just have to actively pursue the study of the craft and keep at it. Find employment in another field to pay the bills and keep plugging away. My favorite novel is Guarding Shakespeare, because it is lighter than my other work; more fun. 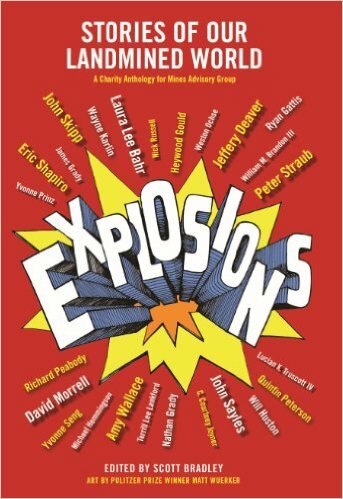 My favorite short story is “Broken Doll,” because it features my new character Private Eye Luther Kane, who debuted in “Damaged Goods,” which is featured in the star-studded Mines Advisory Group (MAG) charity anthology, Explosions: Stories of Our Landmined World, edited by Scott Bradley. All of the proceeds from the sale of Explosions are being donated to MAG. In what directions would you like to take your writing in the future? 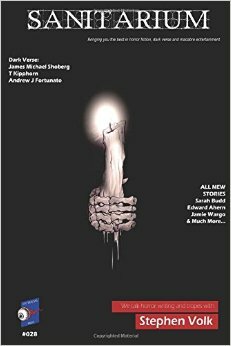 Aside from continuing to write crime fiction, I’d like to return to horror and science fiction, which I did with “Hope to Die,” featured in the British horror magazine, Sanitarium. Also, I’d like to feature Private Eye Luther Kane in a graphic novel. I’d also like to see Guarding Shakespeare produced as a film. The Pitch: The Maltese Falcon meets The Da Vinci Code. 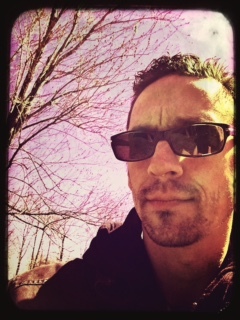 Big thanks to Quintin Peterson for being part of this week’s author spotlight! You can find out more about his work at his Amazon author page and his online gallery of artwork. This entry was posted in Fiction, Interviews and tagged Sanitarium Magazine on July 8, 2015 by gwendolynkiste.